My sister is a devout hater of cheese. I’ve tried to persuade her. I’ve tried to trick her. But she can smell vacuum-sealed parmesan even when it’s in the next building. 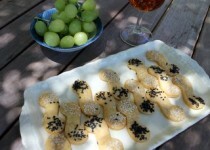 I developed these savoury no-cheese biscuits for her hen’s party last week.